Opera by Carlos Gomes, Brazilian composer; libretto by Antonio Ghislanzoni, based on the novel "La Festa delle Marie". The story takes place during the 15th century in Venice and Istria, Italy. 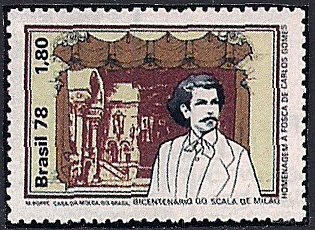 The stamp shows Gomes and the opera stage scene.